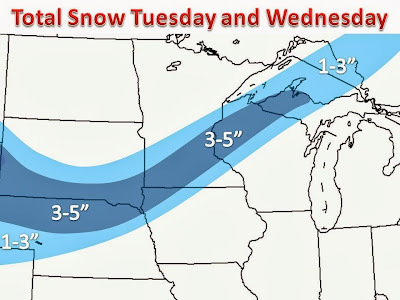 A very narrow band of moderate snow, heavy at times will over take parts of the Midwest Tuesday into Wednesday. An area of low pressure will emerge from the Rocky mountains later on Monday and move north quickly. Enough cold air will filter in to change over any rain to snow in the areas seen on the map. Rain will fall to areas further east. The ground is still somewhat warm, so a lot of the snow will compact quickly, but will still pose problems for motorists. Stay safe, and enjoy the snow, or wait for the warmer weather later this week!